I just went from electronic to acoustic drums and our church has a new sanctuary that echoes (hard walls and ceiling) like crazy. I have always played my acoustics in the past with no bottom heads, but now my drums seem to be overpowering in the church's huge sanctuary. I have tried gel muffles, rings and now need to know - will bottom heads keep the drums any quieter or is that a non-issue to the volume? It is not so much a matter of volume, but of unwanted ringing that the addition of bottom heads will reduce. The bottom heads are there for a reason--to resonate with the top heads for a controlled tone. When you take away the bottom heads, you are just sending the sound out with no mitigating influence to the overtones. Try adding bottom head and keep the rings. Thant should help. 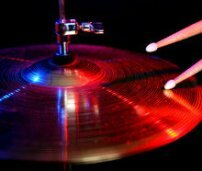 If the drums are still too loud, your options are to play more quietly or put some kind of muffling material inside each drum (not especially good for the tone).